The place had a pristine tranquility to it, one that is capable to absorbing large amounts of tumult. I deposited my footwear in an unguarded pigeon hole and walked into the Mutt in my military cargos. 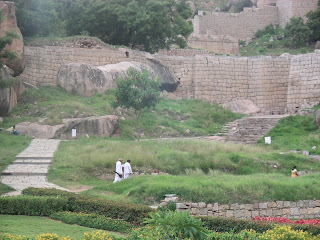 At 7 in the evening, I was in no great hurry; I had traveled 300kms since morning – visited Lepakshi and Chitradurga fort. I took my time to read off the Kannada board “Sri Jagdguru Murugharajendra Bruhanmata Samsthana”. The smell of incense and vibhudhi filled up the meditation hall. It looked more like a church with single large photo of Basavanna on an elevated platform at the far end of the hall. The Bridavan of the seer Mrigarajendra was the most peaceful – a bhajan played repeatedly and time seemed to tick in slow motion. I sat down in padmasan, closed my eyes and started to chant the Omkara, oblivious to the others walking in and out. I wanted to spend at least 10mins in meditation, when I opened my eyes again, nearly 25mins had passed. I didn’t pray for anything in particular, but I was blessed with a very moving experience. The Mutt provides dinner as prasadam to all devotees and I was shown the way to the dinning hall. But even before I could enter, there were some hundred little kids who appeared out of nowhere and queued up in front of the entrance in gaiety. A ‘teacher’, told me about how there were 170 orphan children residing and studying at the Mutt. I moved to the end of the queue, I was surely better fed than them not to queue up. I sat down facing some 50 kids in the opposite row – the multitude of thoughts in their heads and the manifested reactions, gestures, actions, expressions was unbelievable. While we were served Ragi mudde, rice, sambar and butter milk, some kids envied the size of the ragi balls on the others’ plate, some played nudging games with their neighbors, some passed on excess rice to others (plus poured out sambar too), some stealthily examined the guests and some others simply gazed dreamily. And in your own head you worry about seemingly important things – career moves and wooing woes, crude shocks, bottom fishing and bleeding portfolios, traffic jams and how-to-nudge-that-moron-off-the-road. This one experience was enough to absorb all that turbulence. The meal not only filled my stomach, it filled my heart too!! Where is this lady from? Where is Germany? Why are you running? Where are you from? What money do they use there? Is the ‘Gandhi’ money used in Bangalore also? Do foreigners have lots of money? How many rupees can you buy with one dollar? How much have you studied? Where do you work? How much money do you make in one month? Have you seen Indian cricketers? Is Dhoni better than Tendulkar? Insatiable appetite of this 12 year old left me groping for answers. Chandrasekar and Dhoni (I could get his name inspite of asking twice, I called this cute kid “Dhoni”) joined Sabine, Athreya and I on the return leg of the TDB canal run. 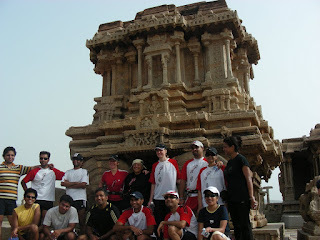 About a dozen RFLers ran along the TBD canal on the Saturday evening – the day before the Hampi Heritage Half Marathon, a distance of about 15kms, against some gusty, ballistic winds threatening to blow us off into the canal. 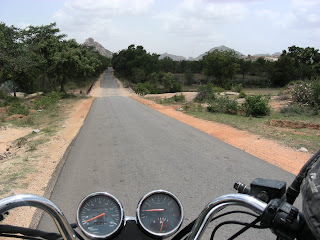 I set off on Friday, 17th morning, quickly getting off the highway, towards Doddaballapur – Hindupur SH9. The road opens into some spectacular landscape almost immediately. Riding alone into the breeze, the thump of the bullet fighting the howling winds to reach my ear drums, the familiarity had a strange home-coming feeling to it. It was only after some 100kms when I reached Maakalidurga where the road hugs the railway track like a DNA double helix, that I realized that the road was taken before – the penukonda ride!! Remember the 24 Karat Action?? 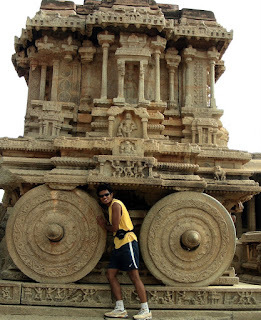 I reached Lepakshi at 10:30 after passing through some rib-tickling places – TondeBhavi and Auto Nagara. By then all the pores had opened up and I was ready to soak in any amount of gyan, I took the services of a guide! I offered my prayers to the deity, Veerabhadra and the 5 lingas, a more realistic form of Padmini was top of mind. I took a longer route via Madakasira-Rolla-Agali-Sira-Chitradurga and was able to reach Chitradurga only by 4:30 after a brief stop at Ravi Bar and Restaurant outside Sira. Had just enough time to visit the Chitradurga fort, where the guide Channabasapa built stor(e)y after stor(e)ys, the Palegaras who built the fort couldn’t have built more! Riding around the Chitradurga fort in fading twilight is enough to send down some shivers and must have been truly impregnable in its times. I also visited Chandravalli lake and Ankali Fort, walking down eerie steps into the subterranean dark chambers with a candle, being told about the swami’s who performed penance, was straight out of a Indiana Jones movie. I reached the Hotel Mayura Bhuvaneshwari at Kamalapur outside Hospet on Saturday morning. Rajesh, Leona, Reena and I went around the ruins near the Krishna temple, Virupaksha temple to reach the over-hyped “Mango Tree” for lunch. While they had all kinds of cuisines – Chinese, Tibetan, Vietnamese (joking!! 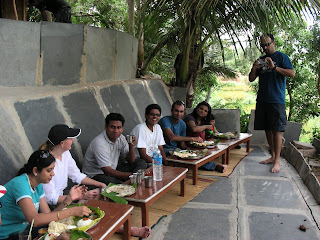 ), they missed out on North Karnataka meal. How can one substitute Momos for some authentic Jolada Rotis (Jowar Rotis)?? Step 5: There is room for more small pebbles, right? Thanks to Sabine, Sam and all of Sam’s relatives - Babu Mama, Santosh, Prashanth (and the phat-phati full of cheerleaders), we had a wonderful itinerary covering some 35 places!! We started at 6:15 from the hotel and spent a very memorable 5hours running, taking pictures, listening to Sam as he helped us with the history, marveling at some of the ruins. Our supplies phat-phati ensured that we did not run out of fluids. Upon Sabine’s insistence we managed to complete 21kms. How often do you run a 21km distance and manage to travel from 1 CE all the way to the 14th and 16th century? It was a fantastic experience. The cherry on top was still to follow, we were treated to some finger-licking Jolada Roti and Badane Ennegai lunch at Sam’s house at Malapangudi after the run. Step 6: Just when you think you nearly filled the mug, take a fistful of sand and pour it in… there is still room for more!! The inflation catching up with Lakshmi Tiffin Room, Chitradurga – Rs.3 for extra cup of sambar!! Step 7: And when you finally agree with me that the mug (likened to the trip, you remember) is finally full, proceed to pour in some Kingfisher Beer. The Beer sizzles through the remaining spaces making the mug truly full. In pouring rain and soaring spirits, we downed mugs and mugs of the bitter fermented fluid, making pretext of carb-loading (the quintessential pre-race ritual), making RFL jokes, polishing off pakodas and masala peanuts, cracking pjs, matching every pitter patter, the rains made outside. Moral of the story: No matter how full the ride/run may seem, there’s always room for a few Beers!! Thankyou very much for the vivid description! !